We talked about the importance of everyone's vote being equal and we should respect different people's opinions. We look forward to the Rainbow Room being open later in the year. On Sunday 10th July our year 2 children joined children from Northlands Primary School to perform as part of the Rugby Festival of Culture. Songs about James and the Giant Peach were composed by musicians Jo Foote and Jen Elvy for the event. Jo and Jen came into school to work with the children in the week running up to the event and quickly had the children singing beautifully. 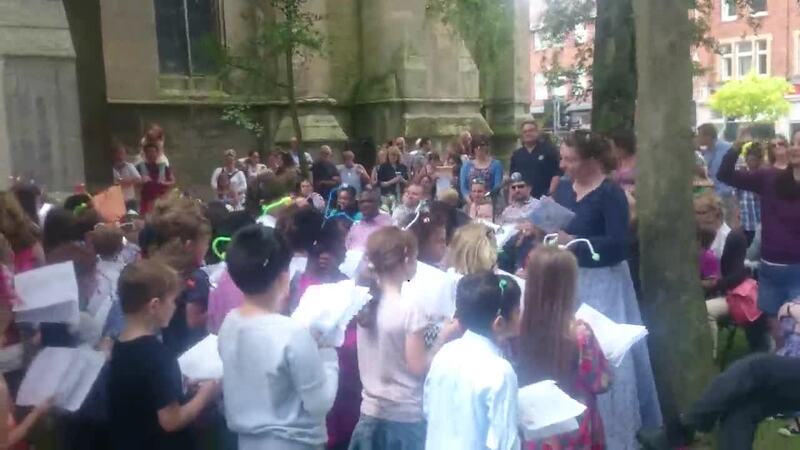 On the day children from both schools performed confidently in front of 150 audience members in the gardens of St. Andrew’s Church. Thank you to St. Andrew’s for hosting, Rex Pogson for organising and Jo and Jen for their musical talents. Children across the school have been playing tri-golf this term and to give the children a chance to put into action what they have learnt, we took year 2 to Ansty Golf Course. The children had a go at using the driving range, playing on the par 3 course and even tried the new sport of foot-golf. The children had a great day and many left the course wanting to come back and play again. Our thanks to Ansty Golf Course for accommodating us. Last week our year 1 & 2 chidren had an assembly taken by ‘Cycall’ as part of the celebrations around the Women’s Aviva UK Tour, which runs through Warwickshire. The children were given the challenge of cycling around the playground and seeing how many laps of the playground they could do in 15 minutes. The children asked friends and family to sponsor them to raise money for the ‘Wheels For All’ campaign, which aims to set up two inclusive cycling hubs in Warwickshire, with specially adapted bikes. On Tuesday our year 1 children completed part one of the challenge and later in the term year 2 children will complete part 2. Following our ‘Take on Tour’ assembly and part one of the challenge, the Aviva Women’s Tour stage 2 rode through many areas of Warwickshire. Sprint hotspots and Queen of the Mountain sites were full of spectators enjoying the scene. Amy Pieters of team Wiggle High5 outsprinted defending champion Lisa Brennauer (Canyon-SRAM) in a rainy finish at Stratford upon Avon. Marianne Vos (Rabo Liv), current Olympic road race champion now holds the yellow race jersey. On Tuesday 17th May Reception visited Ash End House Children’s Farm and had a brilliant day. We started our day off by learning about different birds of prey and some of us were even able to hold one. We walked through the allotments, (which gave us lots of ideas for gardening club) on our way to the Hatchery where we learnt all about how an egg turns in to a chicken. We had a fantastic time with the sheep, lambs and goats, we were able to feed them all and understand about the produce that they give us. We finished our day by going to visit Cow Corner and learning lots of facts about cows- we were amazed that one cow can give us 26 litres of milk every day! Year 1 visited Birmingham to learn about Islam at the Ghamkol Sharif Mosque and Judaism at the Singers Hill Synagogue. Shahid told us about the history of the mosque and how it is now one of the biggest in Europe. The children were amazed at the size of the main hall, with its decorated ceiling rising up into a minaret. mosque, the synagogue was a spectacular building, much bigger than most of which children were familiar with. The children enjoyed the coach journey and seeing the countryside gradually turn into city, thereby the trip supported their learning in geography as well as in R.E. For World Book Day we held ‘The Big Read’. Children (and staff) spent half an hour reading anywhere in the school. Some children chose different classrooms to their own, some read in the staff room, one child read under Mr. Dewes’ desk! It was particularly nice to see children of different ages share books. The idea behind World Book Day is good, but it is what we do on a daily basis which sows the seeds of a life-long love of reading. So as well as high high quality guided reading and phonics teachin, we had our weekly class reader sessions in years 1 and 2 on World Book Day too. Year 1 are currently reading The Iron Man by Ted Hughes and year 2 Pippi Longstocking by Astrid Lingren. We are pleased to announce that the school has been designated by the National College for Teaching and Leadership as a ‘National Support School’. As a National Support School we will host visits from other schools who will look at what we do. Our headteacher, Ian Dewes and his colleagues will also visit other schools to help them develop their practise. We have been involved in these sorts of activities for a while and our staff have found them to be useful ways of developing their own skills. By becoming a National Support School we will be able to further develop and retain the existing skills of our staff. It will also create an additional source of income for the school. As part of this work, Ian has been designated a National Leader of Education. Parents of children in year 2 may like to look at the following video created by Michael Tidd, a teacher in Nottinghamshire. They contain an overview of the way children will be tested in May. Over the last two weeks our children have been learning the words and sign language for a song called Reach Out Your Hand. This is part of an event called Sign2Sing where children in different schools come together to sing an learn sign language. Sign2Sing is a fundraising event, raising money to transform the lives of Deaf children and adults. We are grateful to the Junior School for hosting the event. The children enjoyed being with the older children, especially those with big brothers and sisters. You can listen the song here. We are very pleased to share with you our OFSTED report. You will see the school has been judged “outstanding”, the highest possible rating, in every area. The report has been the culmination of the work over many years (starting well before our time at the school) by many people. Although this is by many measures a small school, we employ 57 people. All the staff, (teachers, teaching assistants, nursery assistants, cleaning, site and office staff, as well as those who work at lunchtimes and in Owls) have played their part and we are hugely grateful to them all. There is a limit to what the inspectors could see in just two days, but if they had stayed long enough they would have seen that all 57 of our colleagues work extremely hard and play an important role. As well as those who work at our school, there are many who give their time for free. Governors have a crucial and demanding role, the PTA work tirelessly to support the school and there are a number of other volunteers who support teaching and learning. Again, I am very grateful for their commitment and help; they have all played their part in the school receiving this judgement from OFSTED. I would also like to thank all parents and carers for their support. We hope you take as much pleasure in this report as we do. Finally, the children of this school are fantastic and it is a pleasure and a privilege to teach them. They are all coming home today with special stickers as a small reward for their hard work. As great an achievement as this is, we are aware that the report is essentially an historical judgement; it is based on what the inspectors saw over the course of two days, coupled with data on outcomes in children’s learning in the last three years. As a school we are aware that being classed as “outstanding” does not necessarily mean we will continue to be so, or that there are not areas we can improve. We would like to assure you that we will always strive to give your children the best possible education and care. As part of our “Over and Above” programme we welcomed Graeme Mitcheson into our school. He is an artist who produced many fantastic pieces of sculpture across the country. He spent a day with the children explaining what a sculptor does and helped them come up with designs. These designs were then combined into one and Graeme spent time in school creating the finished piece. Over the course of four days, all children had a go with a chisel and hammer. Not only have the children learnt in a very practical way what a sculptor does, they have helped create something which will be in the school’s grounds for generations to come. Year 1 have been learning about how to write a set of instructions. The children made blackberry and apple crumble and they tasted delicious. The children will using the experience to write their own set of instructions about how to make blackberry and apple crumble. On Saturday 9th May, eight girls from year 1 & 2 represented the school at a football tournament arranged by Rugby Town Junior Football Club. Well done girls, great effort. To support their topic “things that go bump in the night” year 2 visited Brandon Marsh. They braved some indifferent weather and learned about the habitats and lives of nocturnal animals. They also had a great time building dens. Should all votes be equal? “If one class wanted something, but they had more votes, it wouldn’t be fair”. What if you think someone should have voted for a different person? Why is a good idea to vote? This year we will be running a Summer Holiday Club for the first 3 weeks of the holidays. This is in response to feedback from parents and we expect this to be very popular. If you would like to book a place, please download the forms by clicking the link below and return as soon as possible. Thank you. This week in Art, year 1 have been looking at the work of Paul Klee. The children have focused on the piece ‘Castle and Sun‘ and created their own work using different mediums. Well done children. In order to encourage a love of sport we have run a competition to design a rugby ball in advance of the children playing tag-rugby after half-term. The winner was Poppy Goodwin. You can see her winning design below, alongside the actual ball. Poppy’s ball has been manufactured by Webb Ellis and we recently took delivery of 65 balls. All children from reception up will be using the balls after half-term when they play tag-rugby and afterwards the year 2 children will each take a ball home to keep, in the hope that they will carry on playing the sport. As a prelude to the children playing rugby, year 2 children have been learning the Haka. You can see a video shortly. Over the last few weeks our children have been learning to not only sing, but sign the lyrics to a song called “Friends Forever”. This is part of Sign2Sing, an annual event, raising money for the Deaf Health Charity SignHealth. The event gives children an exciting and fun introduction to sign language through music. On Monday, some year 2 children visited the Houses of Parliament. They were one of the first groups of children to access Parliament’s new visits for key stage 1 children. The children learnt about democracy and dressed up as some of the key figures from the State Opening of Parliament, (Isla and Alex were the Queen and Lance and Freddie were Black Rod). They toured the House of Commons and the House of Lords and bumped into Michael Gove outside David Cameron’s office. (Mrs. Marson said it was an accident…) They also carried on their learning about Guy Fawkes from last term and visited the room where he was tried and found guilty of treason. All of the children in the school and nursery watched The Snowman and then produced some brilliant independent writing. Some of the work is now displayed along the main school corridor. Take a look at the pictures below. Over the last seven days there has been lots of Christmas activities. There were twelve performances of this year’s productions, Born in a Barn and Ralph the Reindeer, which were watched by over 600 people. The PTA organised two very successful Christmas parties and our Christmas fun day included a visit from Father Christmas himself. We also had our Christingle assembly. Take a look at a video of Away in a Manger here. In order to make sure our children get a broad and varied education we have our “Over and Above” programme of events. These are experiences which have been chosen to excite children and broaden their horizons. As part of this all children from reception up recently visited the theatre. Reception and year 1 went to see The Gruffalo at Warwick Art Centre, while year 2 visited the Birmingham Rep to see a production of The BFG. The children had a fantastic time and for the majority, it was their first visit to see theatre. We are grateful to the Dunchurch Festival group for donating money towards the trips. We have had lots going on to mark Remembrance Day. All of the children read age-appropriate books, made poppies and took part in the two-minute silence. All children from reception up, will visit the War Memorial during the course of the week and children in years 1 and 2 joined in with a national remembrance assembly. During this half term, Nursery have been learning about the different people who help us. The children have loved looking at different occupations, and as a consequence, have been lucky enough to have both the local Police Officer, and Rugby Fire Crew visit us. They each brought their vehicles and allowed the children (and the staff!) to ask questions and explore the equipment that they use. Giving the children these real life experiences helps them to consolidate their learning. It’s also just really good fun!